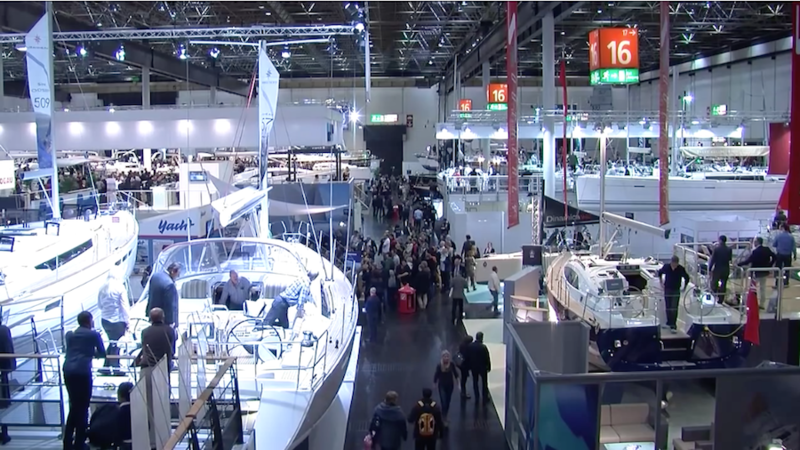 The Düsseldorf boat show, the largest in the world, is Disneyworld for anyone interested in boats and watersports. Seventeen enormous halls comprise all aspects of water sport including sail and motor yachts, dingies and ribs, canoes and kayaks as well as diving, surfing, fishing and destinations. You need a minimum of two days just to see half of it. 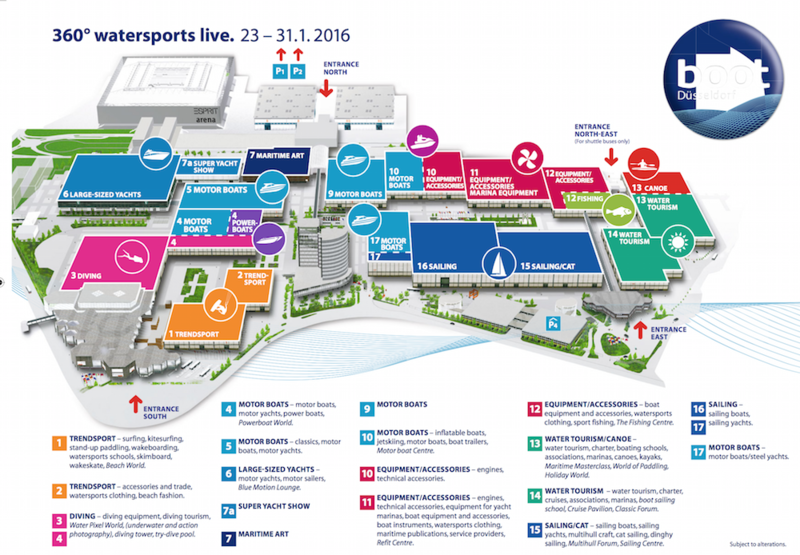 As you can see, the Düsseldorf Boat and Watersports Show is the size of many football fields (compare with the Düsseldorf Football stadium at the upper left). 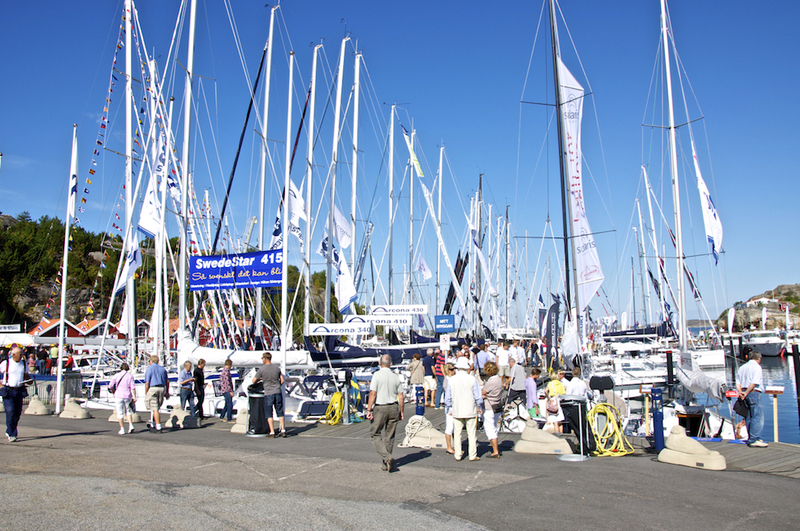 We went to the show specifically to check out our current (back then) short list of boats. Number one on the list was the Hallberg-Rassy 54 or 48. The 54 was being shown, but not the 48, so we showed up bright and early Monday morning to tour the boat and speak with someone from the yard. We wanted to get a feel for the boat and ask ourselves “could we live on this boat on a permanent basis, also with 2-4 guests onboard?” My previous boats were both much smaller — the first, 26 feet and the second, 36 feet. A 36-foot boat is reasonably roomy for a couple and occasionally another 2 people for a weekend, but not much more. I remember feeling really cramped and missing some private space in the boat when we were 4 onboard. It had only a forward cabin, the two saloon sofas as berths and a quarter berth. We really liked the H-R 54 and it became our confirmed “top of the shortlist”. It fulfilled all of the requirements mentioned in the previous post. We were also interested in the Regina af Vindö 49 and the Nordship (which would have been a custom build for a boat of 48-55 ft), but they were not present at the show. In January of 2012, we had no boat — just the absolute certainly that in 5 years we would have one. In my mind, however, we already had the boat. I had absolutely no doubt that this was going to happen. So we started buying things for the boat and for us, her future skippers. We bought quite a few things in Düsseldorf, taking advantage of special boat show prices. Somethings go for as much as 50% off, because it was the last model from last year and they want to make room for the new stuff. I knew what I had, wanted and missed in my former boat, so I started from there. I also knew from past experience that you always need to ask yourself (several times) “do we really need this/will this really contribute to our life onboard?” You always need more storage than you have. We first needed a “sailing wardrobe”. The last time we had sailed was back in 1999. We thought we’d finished the book on sailing and gave all of our sailing gear away to other people, thinking we would never need it again. We had to stock up again from nothing. We would be needing some gear to get us through those 1,000 nautical miles to get qualified for our Swiss ocean sailing permits. We knew we’d being doing most of them in northern Europe, where the water temperature rarely gets above 16°C, so we needed a serious foul weather wardrobe. Gore-tex leather boots (mine: Dubarry, Jacques’: Aigle). It’s difficult to find good gore-tex sailing boots when you wear a women’s size 36 (6 in US) and Dubarry are one of the few who provide small sizes for women (from a size 35 (5 in US). Winter-weight first and second layers and merino socks (we started with synthetics and then went completely over to merino from Smart Wool, Icebreaker and Rewoolution). 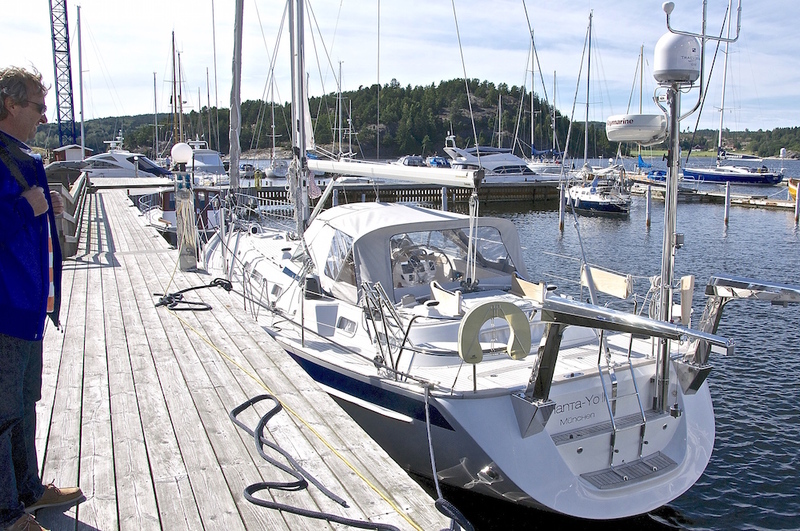 Back in August of 2011, our plan was to buy a Najad or one of the other so-called “Orust boats” (built by yards on the island of Orust on the west coast of Sweden). Hallberg-Rassy, Malö, and Regina af Vindö were all on our short list. I knew these boats after my years as a sailboat owner in Stockholm, and they were known for being robust, classic, high-quality blue-water yachts. The Orust Boat Show. Called “Öppna Varv” in swedish, the show takes place every August on the island of Orust. Much to our dismay at the time, Najad went bankrupt just a week after we returned from our trip. What kind of support would there be for a brand that didn’t exist anymore? So we started looking at Hallberg-Rassy, Malö, and the other Orust boats and decided that the 45 to 54 foot size range would be a good choice for a live-aboard boat. We wanted to have enough space for permanent living and for friends and family to visit. We also had two large dogs. We couldn’t imagine having 6 people and two big dogs on a smaller boat than 45 feet. Jacques inspecting a Hallberg-Rassy 53 at Vindö Marina on the west coast of Sweden. Little did we know in 2011 that we’d be here with our own boat in 2015. Robust, classic, heavy displacement style. 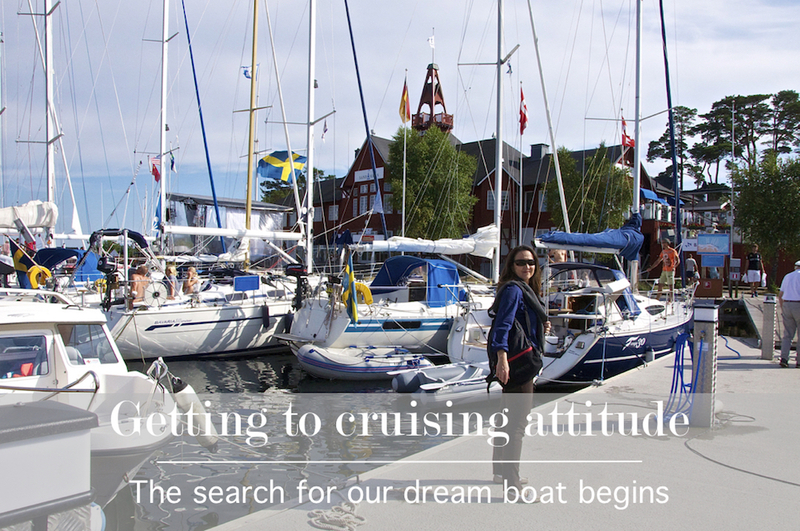 We are going to live and voyage on this boat, not just spend weekends and holidays on it! Well-protected and deep centre-cockpit style, rather than the light-displacement, aft-cockpit, wide-beamed sun-bathing style boats popular in the Mediterranean. Modified (longer) fin keel. And, if possible, shoal draft. My old boat was a long-keeler that drew just 1m60. Why shoal draft? Because in the archipelagos of Sweden and Finland, where we will spend a great deal of time, a boat that draws 2 meters or more will not be able to come into certain anchorages or use certain fairways. Easy to handle for a couple of “a certain age”, and capable of being sailed single-handed. Good interior layout for safety and comfort (lots of handholds, relatively narrow for boat length). We didn’t want a wide “party boat” where you’d be tossed around with nothing to hold onto during a storm. “Homey”. We would need to feel emotionally “at home” on this boat. For us, that meant a wooden interior and a bright, fresh feeling as opposed to the austere interiors found on many modern boats, especially the French and Italian ones. Well-equipped galley, with a good oven, microwave, refrigerator and freezer. I’d like as much drawer or basket storage space as possible. I used to always hate getting on my knees to search for things lost in the back of a lower cabinet or stored underneath the cabin sole. A reliable engine with a reasonable amount of horsepower (at least 2 for each foot). I know, I know, it’s a sailboat. But not every day is windy. We don’t want to be forced to stay at an anchorage or marina we don’t like simply because there’s no wind. Or be “stuck” if we need to stay out of a bad weather situation. Good sized diesel tanks to feed the engine, the generator and the heater. In the northern latitudes, such as the Lofoten coast of Norway, fuel stations may be few and far between. Three cabin – two heads design (so that friends or family visit, they are confortable) and a useful/comfortable navagation station.